We just dined at the #4 restaurant in the world. 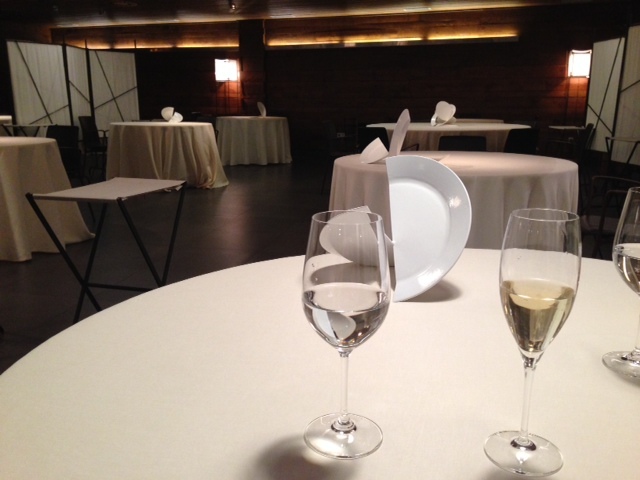 Mugaritz has earned 2 Michelin stars which is the equivalent of the Food Oscars. Renowned chefs work their asses off and try to be as original and creative as possible to even earn just 1 star. Mugaritz focuses on gastronomical cuisine, and as I like to think of it..a chess game between your mind and palette- who will take over? We knew we were in for an experience like no other. As their website states, “the challenge is on the table, you chose how to address it”. So let me introduce you to all the courses and I will try and do my best and describing what I tasted, felt and thought. There were approximately 20 courses of small bites totaling about a 3 hour experience. It is off-season in San Sebastian and the start of winter. Even though it was a rainy Friday night, Joe and I were both a little taken back by how quiet and empty the restaurant was. They greet you with “we want to make you feel at home” and even though we did feel more realized and comfortable, the initial feel was a bit blank. The restaurant is a huge open space with minimal decorations in the way. I was thinking that they want you to think of your plate as the art against a clean, blank canvas. I do love the abstract plates on the tables. Those were pretty neat. They then took us into the kitchen and gave us a quick tour of how they work and then presented us with our first bite. A blood and foie macaron (sorry, I don’t have the photo). Before telling us what it is, the chef had us guess the flavors. I didn’t guess blood at all, but he explained that both egg whites (what macarons are made of) and blood have the same protein component, albumin. This allows the blood to whip up just like egg whites would to make the macaron. This was a delicious bite. It was salty and a bit briney. At this point I thought we were in for the win. I believe this is one of their signature dishes. 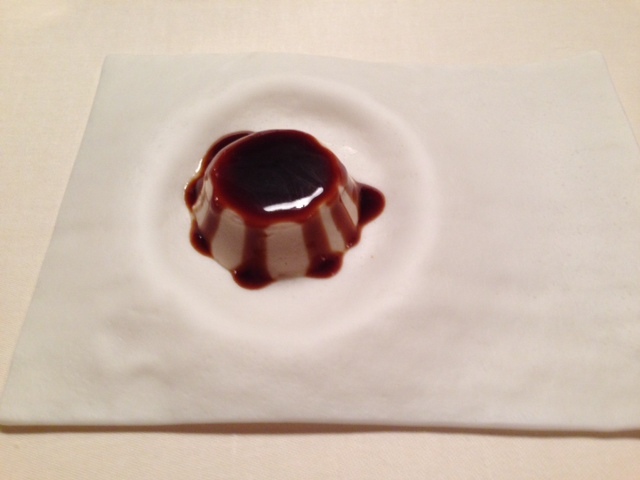 A perfect example of gastronomical cuisine and your mind playing tricks with you. This looks like rocks sitting on grey sand. 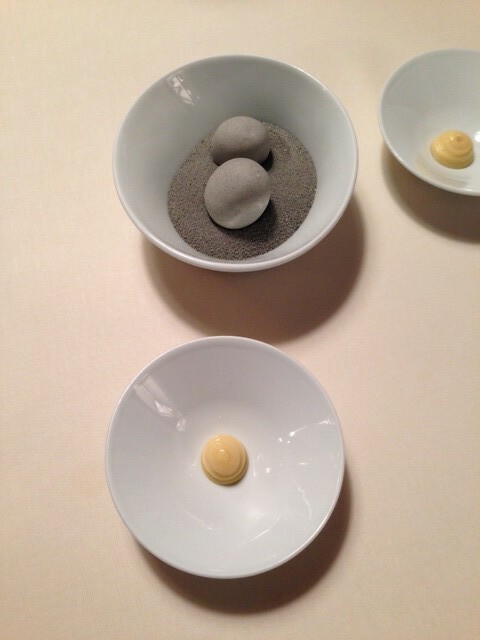 What it actually is, is a boiled potato covered in edible clay. The sand is made up of breadcrumbs dyed with ink. This was a fun start and tasted good. Oh, and the sauce was used to dip the potato in, a dijonnaise I think. This photo is angled a little off (sorry), but you’ll get the idea. 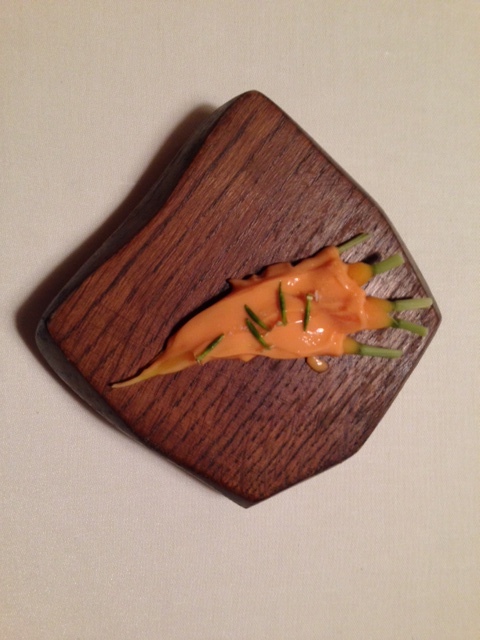 These are baby carrots with a carrot puree/ The dish was adorable to look at and the carrots were s sweet, almost like candy. They must have an insanely fun time thinking of ways to plate their dishes! This is a piece of food art, visually. This was where things started to get interesting and I wish I didn’t know what I was eating before I did. Just as the name says, its tendon, but I forgot to ask from what animal. This tasted like a very crunchy and hard cracker. It was a bit sweet when dipped in the ashy honey sauce. If I didn’t know what this was, I would have never guessed it was made from tendon! We had the most fun interacting with this dish. 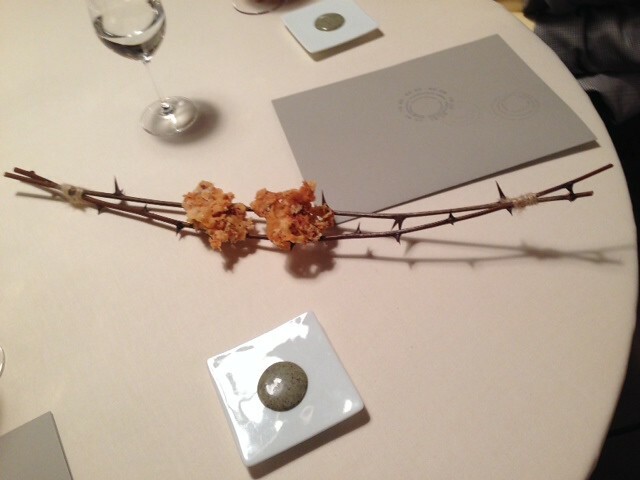 A simple chicory leaf (which I had to google) and on a separate plate was wooden tongs holding a small piece of honeycomb. You were supposed to ick up the wood tongs and gently squeeze the honeycomb and then drizzle honey all over the leaf. 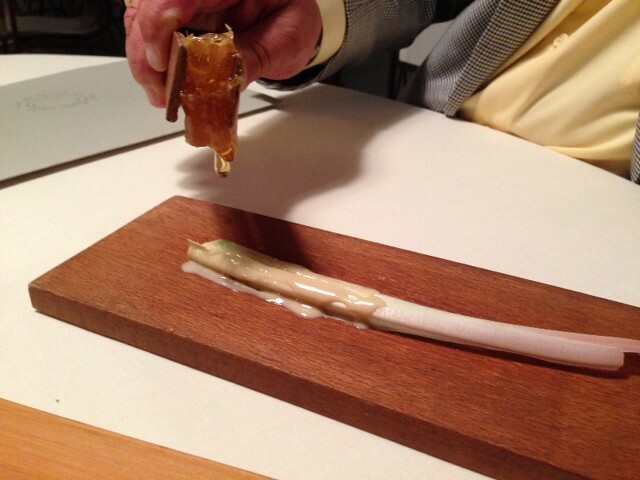 This tasted great…a savory leaf with sweet clean honey..we loved this! 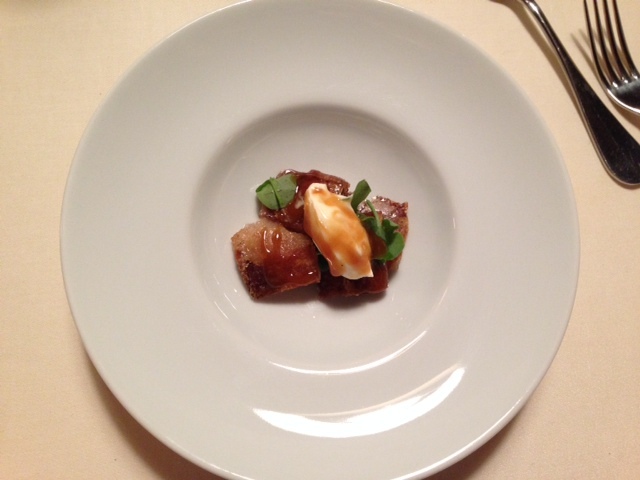 I will never, ever forget this dish…ever. You know when you taste something or smell something and it makes such a huge profound reaction, you know you will never ever forget that moment. That’s how this dish was. 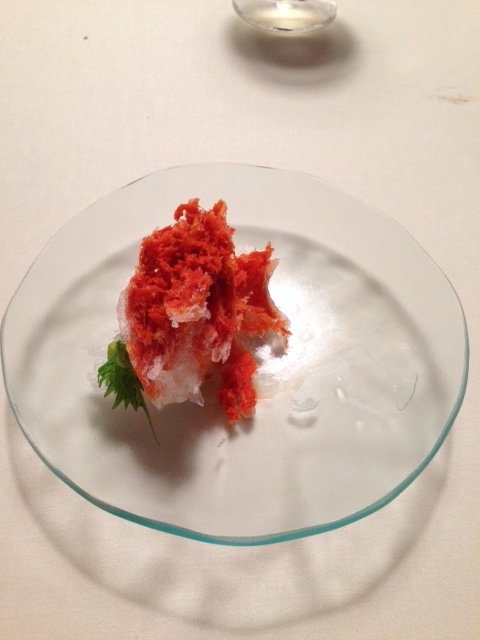 What it was, was a plate of very light ice shreds, or similar to a light shaved ice. Separately was a small vile of dark orange liquid that you were supposed to then pour over the ice and eat before it melted. The orange liquid was the most concentrated shrimp flavor I have ever had. Now I love a good shrimp bisque, but think of that flavor times 100! This was so intense, in such a pure shrimp flavor, that Joe and I both had a difficult time finishing it. Even when I took a sip of water right after, I could still smell the condensed shrimp smell for the remainder of the night every time I drank water. This..was a little much for us. This was another interesting dish. I had to step back in time and remember the fermentation lecture in my Microbiology class a few years ago. As I sat at the table last night, I was confirming in my head…”rice…goes bad…bacteria eats sugar..ferments…yeast…alcohol”. These keywords were not exactly getting me whipped up and exited as I remember my Micro professor telling us what would happen if we left cooked rice out overnight. I took a quick whiff of the dish first and the initial smell that hit me was yeast. You know…that sweet, yeasty, pungent smell we know so well when making bread. 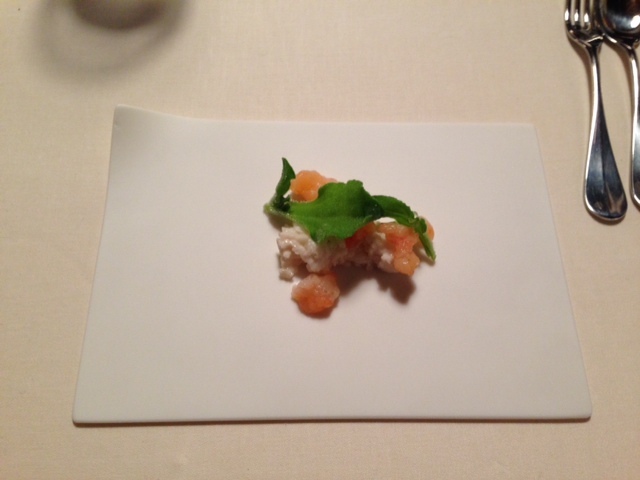 The flavor tasted just like that…room temperate, and almost glue-like starchy rice with sweet pieces of lobster. I would give this dish….2 stars. Yes! finally something I recognize…crab and macadamia nuts! I love crab and I love nut creams. Nuts can make some of the best creams, milks and sauces so I was really excited about this dish. 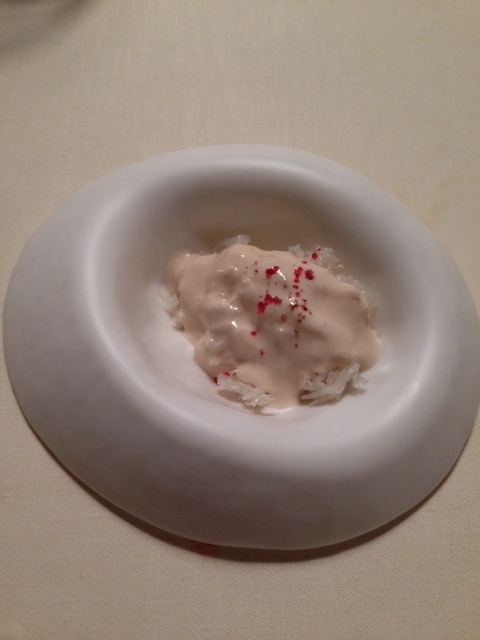 The crab was tender, sweet and very well shredded and the nut cream was luxurious and creamy. This, I enjoyed. You read that right…baby eels. Another dish that I wish I didn’t know before I ate. Joe said he almost had a difficult time finishing this one, because he knew what it was. See…the whole mind over palette challenge. Its crazy! So according to the waiter, baby eels are a delicacy and are only available during the cold winter months. We were the first ones to have this dish and they were very proud of serve it. Baby eels are scooped up from their environment and quickly sautéed for the dish. Without knowing, you think you’re enjoying a pasta dish, it has the same exact texture- a bit al-dente. But then you look closer and that’s when you see it…baby eyes! Now I’m great with “face on my food”, you know, like lobster heads and shrimp heads…those don’t bother me at all! 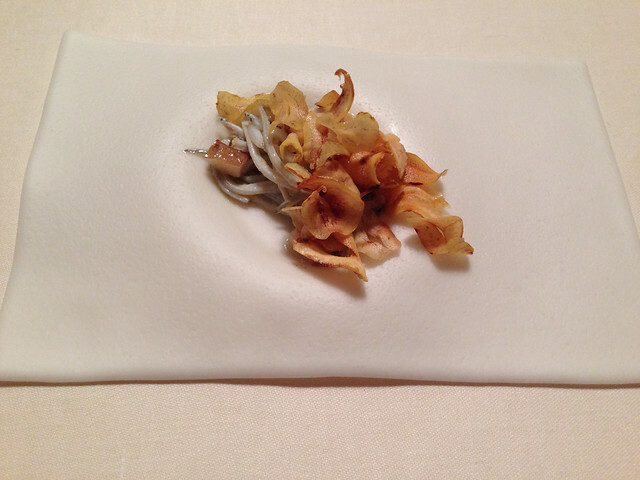 Bit this….baby eels with tiny baby eyes was a game changer. Another texture I don’t think I will ever forget. The flavor was great though, garlicky and delicious…but alas this was another mind over palette challenge. This dish confirmed my challenge with soft textures. Think of a very condensed chicken stock flan. Odd right? Soft tofu was the base but then poured on top was a very concentrated, not salty, but concentrated chicken jus. Picture the most amazing chicken stock you have ever made and then reduced for hours and hours. It was thick and the poultry flavor was pronounced well. What threw me off besides the soft texture was that it was at room temperature. After having the room temperature fermented rice, this dish did not exactly save the day. Another one that we both have difficulty finishing. At this point our palettes felt like it just lost a match with Mike Tyson. Our mind and taste buds were exhausted and I was begging for some texture..anything..crunchy, snappy and fresh. 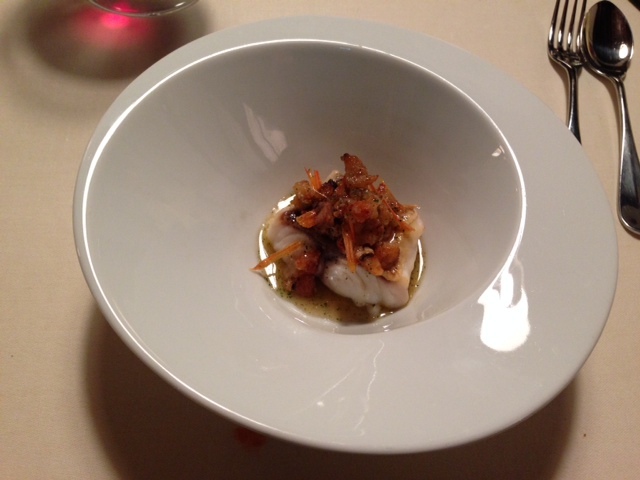 This dish was a variety of fish (I forgot to ask what). There was a filet of fish, what I think was hake that was cooked perfectly and a little under done and was topped with another variety of fish. I think I would have enjoyed this more if it was not after palette punching dishes as served previously. The dish, again was a huge flavor boost of seafood. The colors of this dish are beautiful. Mushrooms are gorgeous in Spain and the mushroom used here was left raw and sliced very thin, it was wonderful to taste. And sweetbreads on the other hand, I like as well and had them in France a few years ago, however, being that sweetbreads is a gland, it offers an almost ‘organy’ taste. Which I don’t mind if it was cut with something bright and sharp. 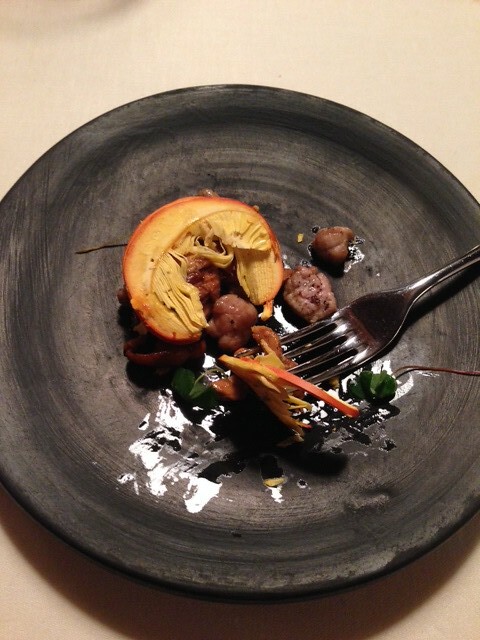 The earthy mushrooms with the earthy and savory sweetbreads was a good dish, but again, after finishing several heavy on flavor dishes, I was still eager for something to brighten my senses. Picture the crispiest pork belly you have ever had! With small pieces of pork meat and fat still accompanying. The first 2 bites were rockin- almost like a thick cut of intensely fatty bacon, crisped up to perfection. The crème fraiche helped cut the fat of the pork, it was cool and creamy, so that was a nice addition. But again, and this is probably just a personal thing, I was still craving something fresh and green! Yes…dessert!! Oh I was so excited about this and it did not disappoint! 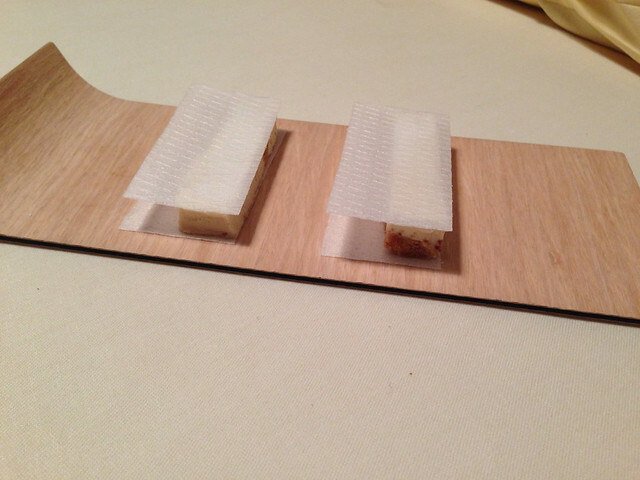 This was almost like an amazing almond ice cream terrine an on the outsides was this see-through thin edible wafer paper. 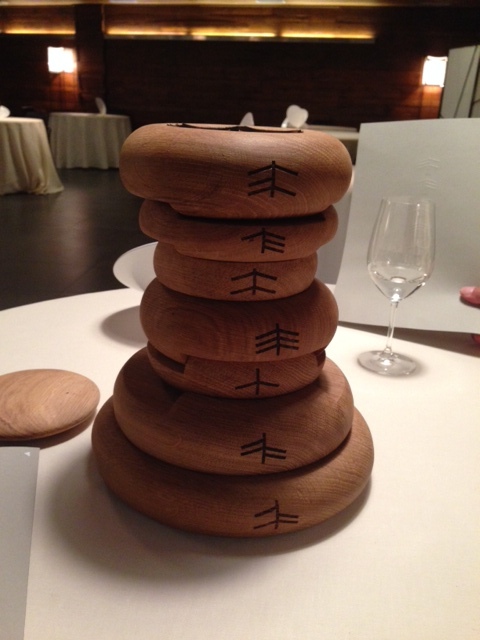 I saw them all over Barcelona and it was the perfect book-ends to hold the terrine in place. This was not overly sweet with great almond flavor. This was a fun dessert to pay with! each tier represented a “sin”; pride, envy, gluttony, etc. I didn’t take a photo of each layer (sorry), but each had different treats like mini chocolates and condensed fruit syrup. It was fun. This was an extra little treat because I don’t eat chocolate (it gives me headaches, so I jut avoid it). 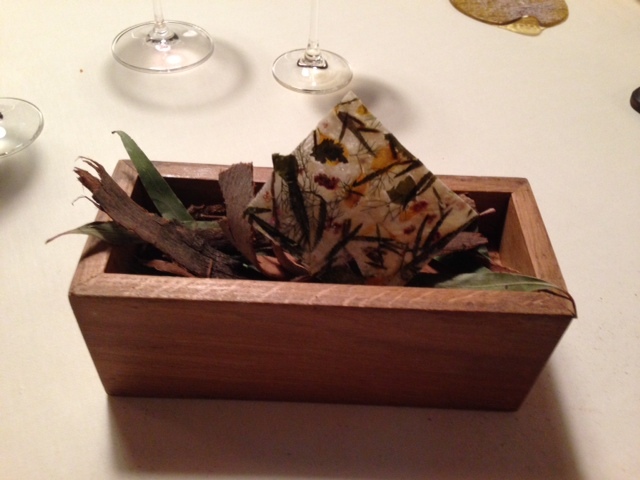 This was paper-thin edible paper with dried herbs from their garden! They plated it in a small box with other dried leaves that I don’t think were edible because I smelled a bit of eucalyptus. The paper was sweet and some of the herbs they sued were sweet and floral…it was a fun thing to try! Ok…well that covers our dinner at the #4 restaurant in the world! I have to say that I really believe the Chef and his imagination and creativity are far passed what we are accustomed to in this lifetime. He is so advanced in flavor profiles and imagery, I don’t think we have caught up yet…if that makes sense? Each course had a strong purpose and was beyond what any of us thought. It was artistic, creative and straight forward. We are so glad we were able to challenge our minds and palettes. Samantha darling, this exciting food experience was described with brilliancy for us readers also, you were able to share it so well I feel as if I had the same journey, I thank you for taking the time on your vacation to write this up, Bravo!! 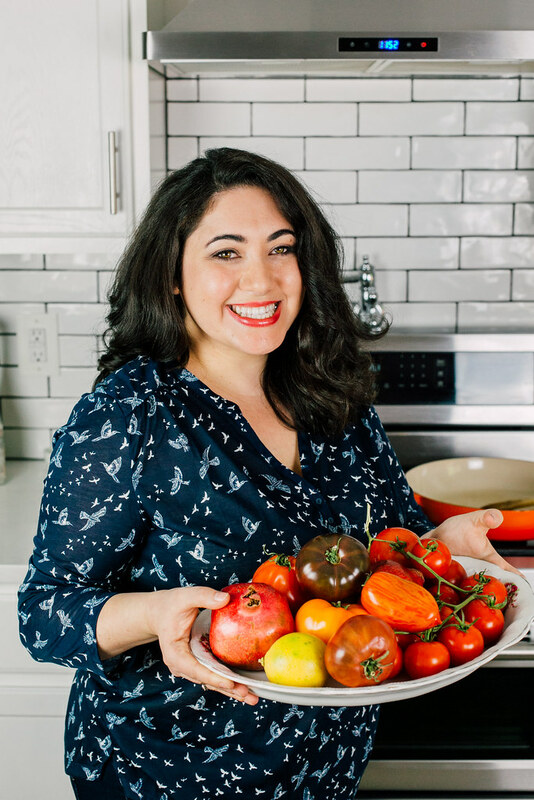 Karla @ Foodologie recently posted..Back from Peru! Ok that looks like the most absurd and incredible meal ever!!! I dream of trying something like this!!! !